Taking the musical helm for Sonic Mania is Tee Lopes. Like the majority of the Mania development team, Lopes has climbed the ranks of the fandom, finding his voice in the community over the past decade through remixing Sonic tracks among many others, before joining Pagoda West and composing the soundtrack to indie title Major Magnet. Sonic Mania’s musical direction could have gone in one of two directions; from day one, Whitehead et al. have made it clear that graphically, Mania was intended to be representative of the 32X era. As such, an obvious direction might have been to follow suite from Knuckles Chaotix and emulate the console’s PCM stereo chip, with chip-tune proving a successful medium for so many modern video games reprising the retro style, such as Shovel Knight. In a perhaps a not-so-obvious move, Lopes has elected to inherit the audio style from Sonic CD, rather than take the chip-tune avenue…and in my opinion rightly so. Sonically (no pun intended), the broader palette provides a much more embellished backdrop to a much richer visual experience, without the capacity limitations of 90’s hardware. Much of the title ventures through familiar territory such as Green Hill and Chemical Plant Zones, for which the compositions in act one have remained on the whole unaltered, only carefully and deliberately mutating in the transition to the second act. Lopes pays proper homage to the original works, and from time-to-time sneaks in a familiar progression from elsewhere in the Sonic series, mirroring the zone cross-contamination suffusing each stage. The real statement of the soundtrack, however, is made by the original compositions in the new zones. The soundtrack to Studiopolis is a prime example in which Lopes really falls into his stride, and proves not only his ability to write something so recognisably Sonic, but that he has a deep understanding of the architecture that underpins what makes a memorable Sonic melody. There is a fantastic step change between acts; the mood lifts, the tempo quickens, and it beautifully accentuates the progression of an adventure – something I’ve seldom felt since Sonic 3. This penchant for detail makes itself known so subtly, down to even the choice of synthesiser voices; the muted brass of Studiopolis’ second act sings Sonic CD. The woodwinds of Press Garden emphasize the eastern theme, while the Wild West jingles of Mirage Saloon are embellished with banjo and olde-timey plinky-plonk piano, jarred back to the present with a periodic turntable scratch. One personal favourite composition is the mini boss theme “Danger on the Dancefloor”, a subtle nod to the involvement of a certain late, great King of Pop in both name and style, with percussion and samples that hark back to the first ever miniboss encounter in Sonic. Mania’s soundtrack also pays respects to other SEGA influences, most prominently the interstellar “Hi Spec Robo Go” – a full paced funk track with jazz licks and a smattering of Naganuma’s Jet Set Radio, one of Lopes’ many acknowledged heroes. It doesn’t feel like there are any junctures in the game where the music hasn’t been carefully thought-through; even the calypso menu theme delivers a wink and a nudge to the long-time fans (another reference to Sonic 3), and another example of how attentive the Mania team have been when constructing every element of the game. Lopes himself confesses in an interview with The Verge that his intention was to make the older Sonic fans feel young once more, and I’m happy to report that he has succeeded in his mission and exceeded all expectations; I feel the Mania soundtrack will rightfully take a pedestal alongside it’s forebearers. Lopes’ comprehensive grasp of Sonic soundscapes is nothing shy masterful, and sets the standard for what I hope will be the first of many Sonic soundtracks from this talented composer. While the Mania soundtrack has yet be released on CD, the vinyl version has already been offered through video game soundtrack purveyors’ Data-Discs. For those who haven’t heard of Data-Discs, they are a UK-based record label responsible for releasing some superbly remastered classic video game soundtracks, including Streets of Rage, Gunstar Heroes and Outrun, all on 180g vinyl. Undoubtedly UK Sonic fans and music collectors alike will not only be elated to see a Sonic the Hedgehog soundtrack get a British release, but the first ever (and hopefully not the last) release in this medium (excluding of course the limited release of Sonic R’s Work It Out and the Sonic Adventure Remix EP). Even if you do not own a turntable, there is a joy in physically holding a copy of this soundtrack, if for no other reason than to appreciate the artwork on a greater scale than you would be able to with a CD cover. As with all previous Data-Discs releases, the entire product has been assembled thoughtfully; the cover artwork uses the Sonic Mania stylisation, and is embellished with a spot varnished illustration. The vinyl itself is packed with 16 tracks from the game, all of which are selected from the brand new compositions, including all 9 songs from the 4 new zones alongside the boss, intro, special stage and menu themes. Some may be a little disappointed that this product is not a comprehensive compendium of the entire soundtrack, but in this case one has to be mindful of the limitations of this media. At 33 rpm, there is capacity for about 22-23 minutes of music on each side, and thus there is a limit to what could have been included (a complete soundtrack on vinyl would have likely constituted a 3 vinyl box set, and an elevated price tag that would have likely dissuaded many from purchasing it). 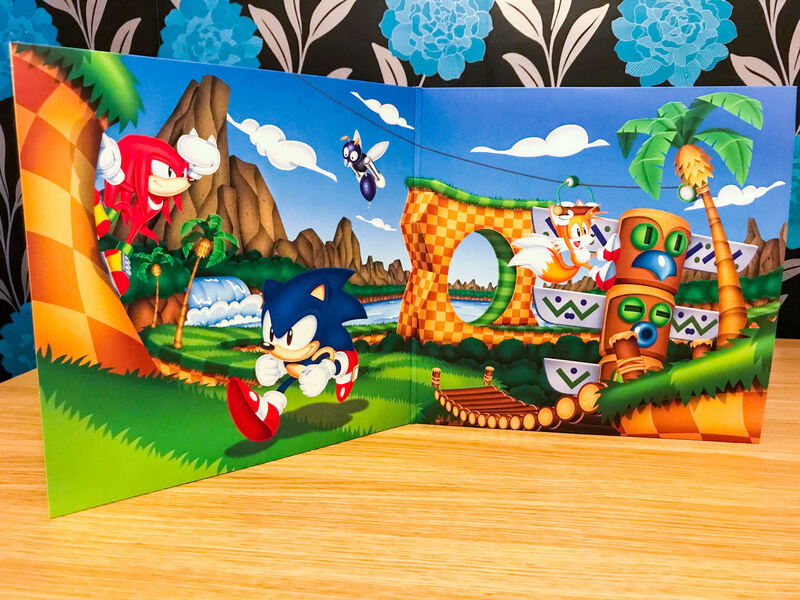 The gatefold artwork depicts a beautiful Green Hill Zone panoramic featuring Sonic, Tails and Knuckles, created especially for the vinyl release by Sonic Mania artist Kieran Gates, and likely one of the big selling points for those buying the album for its aesthetic qualities rather than to play it. The vinyl itself comes comes in the 180g format. For those to whom this means nothing, all you need to know is that this constitutes a heavier disc, in comparison to the lighter 125g offering that was more common throughout the 70s and 80s – nowadays, most vinyl will often be produced in the 180g format. This creates a more robust product that will last longer, and has less to do with sound quality which is more dependent on the source and mastering (in this case, expertly accomplished by Falk Au Yeong). The sound quality is rich throughout, and depending on your sound system is indistinguishable, if not superior to the soundtrack experience when played in-game*) There are however slight differences in the three versions offered, which include a standard black, a translucent blue and a limited edition 4-colour spatter on a clear disc. We reviewed the blue edition here, but found there was no noticeable difference in quality between this and black version. Data-Discs do however state themselves there will be some very slight difference in quality on the limited edition due to the production process used to create the colour effect. As the limited edition was only available for 48-hours, it will most likely be the version to appreciate in value most over time. A nice little touch on the vinyl is the split of the act 1 and act 2 themes onto side 1 and 2 of the vinyl respectively, which results in a pleasant ordering of tracks instead of a chronological presentation as might be expected. Each track has been re-edited with an outro to conclude, making each song feel much more like a complete and contained piece rather than just fading on the loop. Some songs only see two complete loops before the outro which sometimes feels a tad premature, but is more so another feature of the space limitation than a comment on the compositions themselves; again, some will feel the omission of the Egg Reverie theme and the opening animation music makes this offering seem a little less than comprehensive. 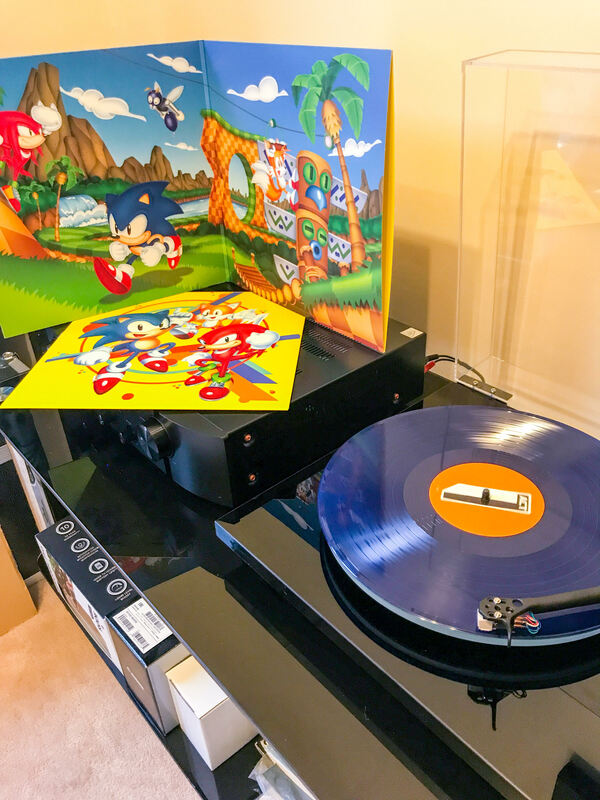 Overall, this vinyl release is a great edition to any video game soundtrack collection, and has hopefully proven to be popular enough that we can expect more Sonic the Hedgehog releases in the future on this format. When is the digital and CD release supposed to be though!? Not all of us can afford fancy-shmancy record players and prefer to have a more convenient way of listening to our music, particularly ON THE GO. I want to know I can enjoy these classics on my phone without having to download some ripped version that just loops all the songs into infinity with no outro to conclude. That and I actually want to pay for this musical experience, Lopes deserves it. The vinyl actually comes with a download code of the Sonic Mania Vinyl OST for download in both MP3 and FLAC formats. This version of the OST only contains what’s in the vinyl, nothing else, but at least you get to have the neat outros featured in the Vinyl. As for an actual digital OST, you can find it in the Steam store, all you have to do is search it up. I really want to give some money towards this fantastic soundtrack but I’d rather have a comprehensive collection on CD which includes all the game music. Make it happen Sega! I hope SEGA and Sonic Team will understand that if they release an official Mania OST, they need to have ALL of the songs that is in the game. Who agrees with me? Agreed, I never understood why the omit so many tracks from their digital releases. Considering they’ve consistently done this since the Adventure games, I think we’ll see a full soundtrack in the near future.